Every time I start to blog, I feel like taking a nap or going to bed instead. This is because I'm waking up at 6 AM now. By 8 PM I could go to sleep but that feels lame. So I stay up and eat too many Julio's chips and try to find something nice and British on Netflix. Most nights I give up. Last night I watched Daniel Deronda. By 10 PM I'm toast. God knows how much I hate waking up to the sound of an alarm clock, so He's been waking me up on His own at 5:45. My new journal has owls on it. I hope I will write some wise things in it. 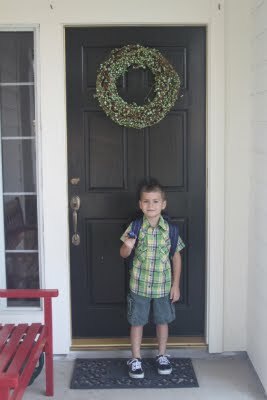 It took Jackson 7 wake-ups to ask if he had to go to kindergarten again today. That was pretty good, I think. 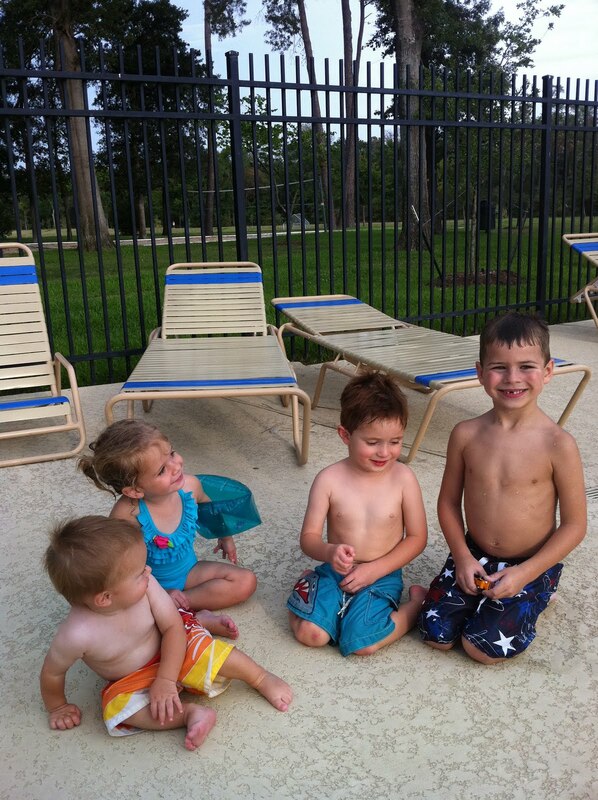 He requested another date at Splashtown instead. He loves school and has absolutely nothing to say that he doesn't like. He told me that thinking of something to write during writing time is hard. I understand. I WILL RUN from As Our Own on Vimeo. People run for lots of reasons. We give you 10. We’ve chosen 10 girls to be featured at 10 races in 10 cities across the nation. Their stories give reason to our running. You can make a difference for countless girls just like them—simply choose a half marathon, join the As Our Own Racing team, and raise awareness and funds. 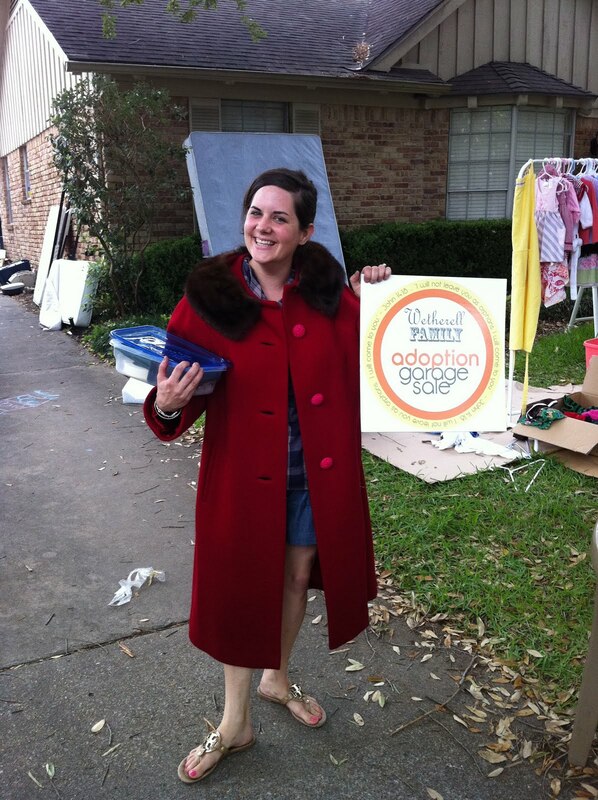 Houston friends, will you run for Aashi? Aashi was born in the red light district in India. Ninety-five percent of girls born there become enslaved. Girls who don't get out early will likely never get out at all. Her mother found a safe, healthy future for her daughter and allowed her to be rescued out of the district at 15 months old. Aashi is now five years old and lives in the loving care of As Our Own. 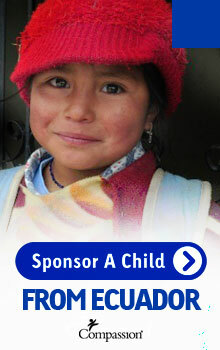 She is learning to play the guitar, she loves song time at school, and she dreams of being a doctor when she grows up. By setting a goal for yourself to run or run/walk a half-marathon for Aashi, you will help Aashi reach her goals. Not in Houston? Visit AsOurOwn.org/run to learn more and join one of our 10 teams. Select and download a training guide to get started! I Will Run features races all the way from Oregon to Florida. Click here to join one of the teams! God has opened the door in India for As Our Own to rescue girls before they are exploited, giving us the privilege to care for each one as our own—for life. We are building strong communities and training leaders to break cycles of exploitation for future generations. 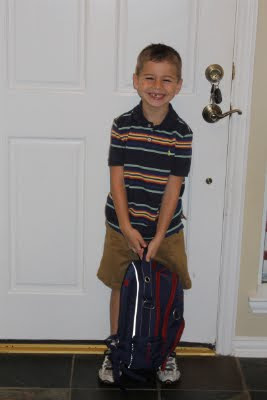 Jackson had a great first day of kindergarten. Thank You, Lord! Here's the recap. On Friday morning we went to Meet the Teacher at his school. He was nervous and didn't want his picture taken. As we walked inside the school he told me his teeth were chattering. Bless his heart. I love his innocence in that he wasn't embarrassed to tell me. 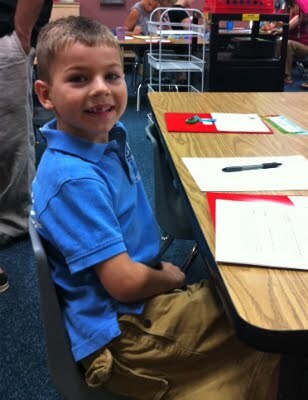 He looked like he was about to cry when his teacher greeted him. 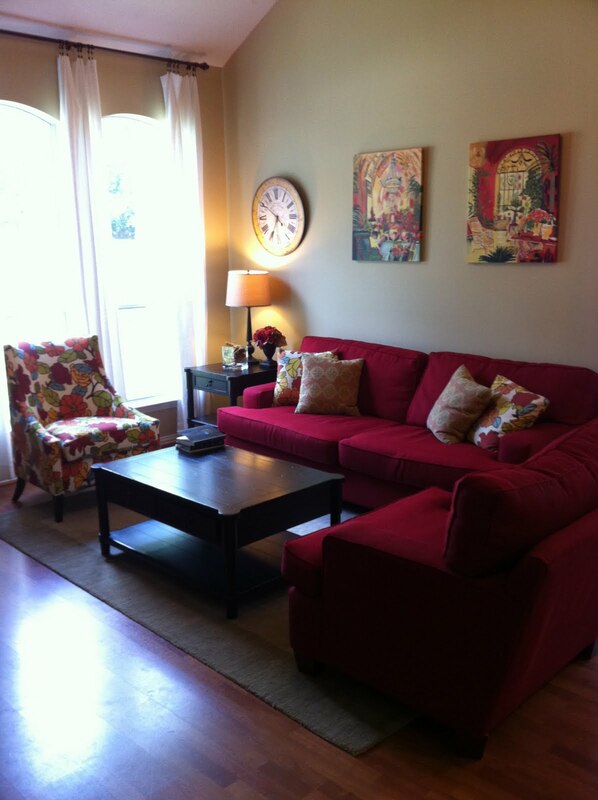 But finding his seat and seeing the room made him more comfortable. 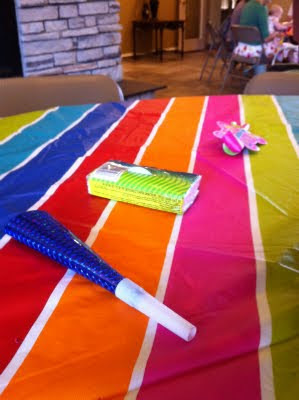 Plus, there was a little trinket on his desk from the teacher and that totally put him at ease. We walked back to the car and he yelled, "Mommy! I'm not scared anymore!" He was all smiles. The date I've had on my mind for a very long time finally came. I woke him up and whispered "Good morning, kindergartner!" We snuggled for a few minutes and he was already at Level 10 excitement about the day. Jackson's signature was required on one of the forms, which I thought was hilarious. He signed it right before he left. So very official! First day pic outside. My camera fogged up and failed me on its most crucial day! 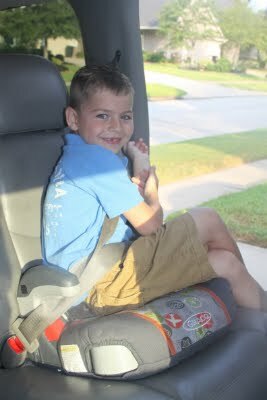 We walked Jackson to school as a family. It was crazy and fun to see all the other families doing the same thing. 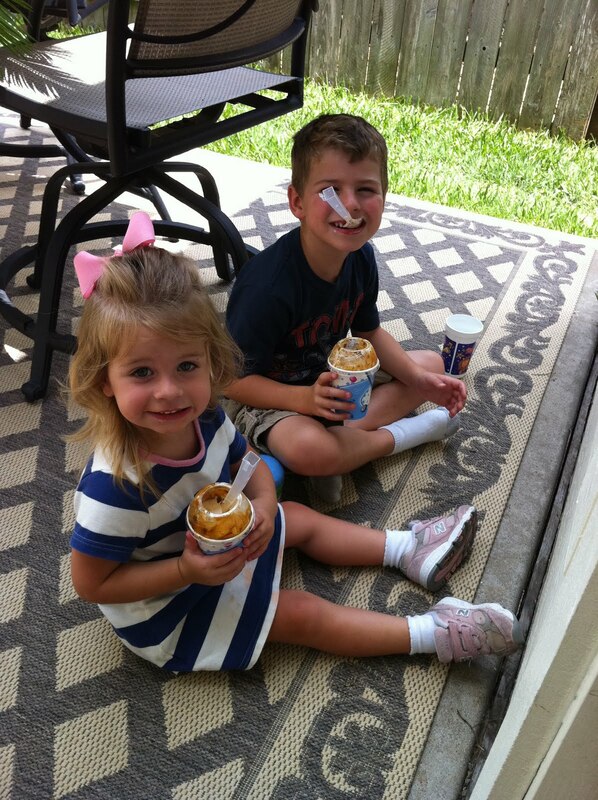 Curt and Annabeth waited outside while I walked Jackson into his classroom. The teacher greeted him at his seat, I said, "I love you, buddy. Have fun," and walked out. But of course I stopped and watched him for a few seconds from the corner of the room. He was having a lot of trouble hanging up his backpack on the back of his chair, so I went back and showed him what to do. Then I left! 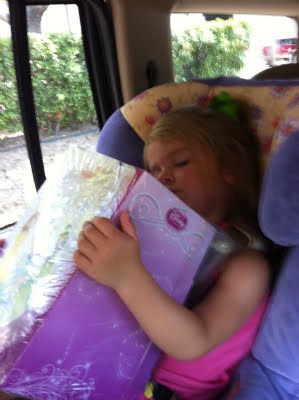 We went back home and there was a truck in front of our house delivering two new mattresses - one for Annabeth's big girl bed. What a day! You can see in this pic that our hair succumbed to the humidity. Thank God Curtis is taking Jackson to school from now on. Curtis sang to Annabeth to make it less traumatic for her that she wasn't also going to school. She was bummed at first. My mom spent the whole day with us and we had a blast together. We went to Memorial City Mall and had lunch at California Pizza Kitchen. (Their Chinese chicken salad is amazing.) My sister was able to join us and we got to celebrate her first day of class at Rice University. She is starting her doctoral program. We call her Aunt Sassa Smartypants. Soon I got a text from my dear friend who works at Jackson's school and she reported that she'd seen him with big smiles and he seemed to be doing great. That was a huge blessing. The day might have seemed 10 times longer if I hadn't heard that. 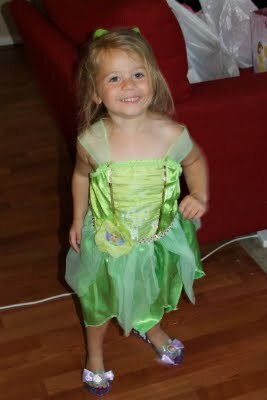 Annabeth scored a Tinkerbell dress and some princess shoes from Bibby. Here she is holding the shoes and having a snooze. 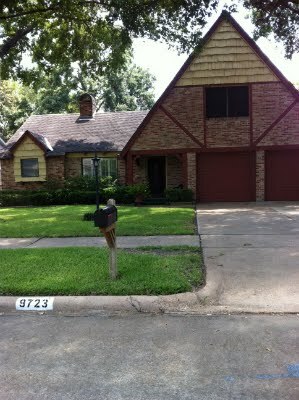 Since AB was asleep in the car, we drove through my mom's old stomping grounds in Spring Branch. This is her old house. Here's Abey as Tink! She loved her dress. She did not love the wings. 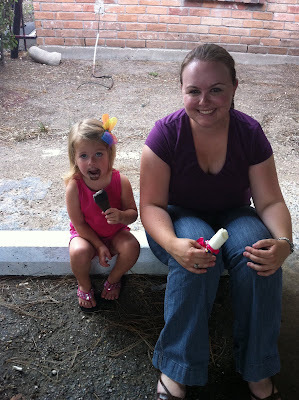 We walked to the school to pick up Jackson in the blazing heat of the day. Mom was such a trooper. Jackson walked out the door with a smile on his face and gave me a huge hug. He was thrilled to see Bibby there. 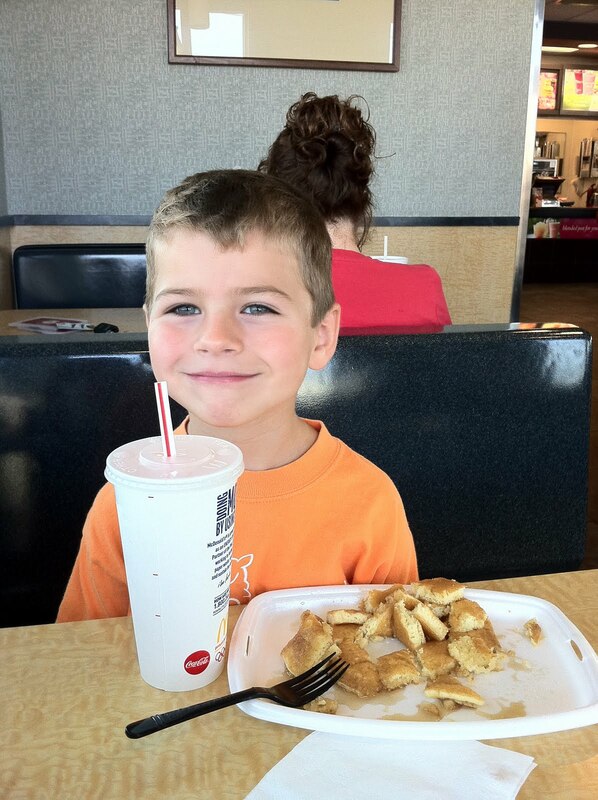 He told us he loved everything about kindergarten and his teacher. He said, "Bibby, you should have seen it!" He also told me he loved it more than recess at his preschool, which was a big statement for him. 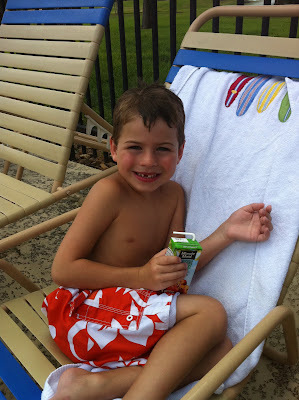 Our favorite thing he said was this: "My teacher asked who wanted to be a kindergarten superstar and I raised my hand!" You can see that Annabeth is wearing her Cinderella shoes. That's because she really, really wanted to wear her Tinkerbell dress to pick up Jackson and I wouldn't let her. 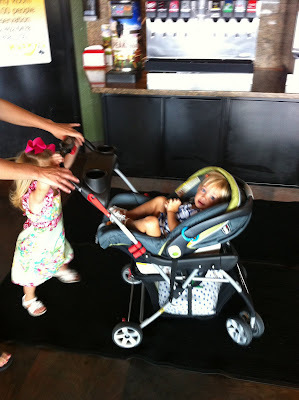 The shoes were a compromise (she rode in the stroller). If we were a month in I would have let her but, have mercy, people, not on the first day. 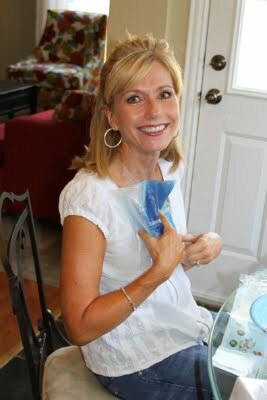 We were a bit overheated so I got an ice pack out of the freezer. It was a ministry. 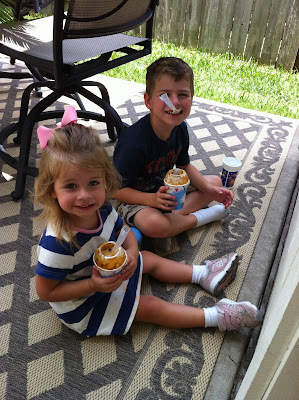 The kids were ready for the traditional first day of school treat - ice cream cake! Mom gifted the kids with gummy lizards and some other, um, unique candy that was a huge hit. Y'all, I was absolutely exhausted by dinner time. The adrenaline wore off and I hit a wall. I can't imagine what the evening was like for the kids and especially for the teachers. I managed to make breakfast tacos for us and then God gave me grace for the rest of the evening. We put the new mattresses on the kids' beds (Jackson's was at least 15 years old), took down the crib, rearranged some furniture, and said goodnight to the kids. They pretty much grew up overnight. I probably would have emoted excessively about Annabeth being in a big girl bed if it hadn't been overshadowed by kindergarten. But I liked it that way. It was like ripping off the band aid. Here's my little Tink before sleep. 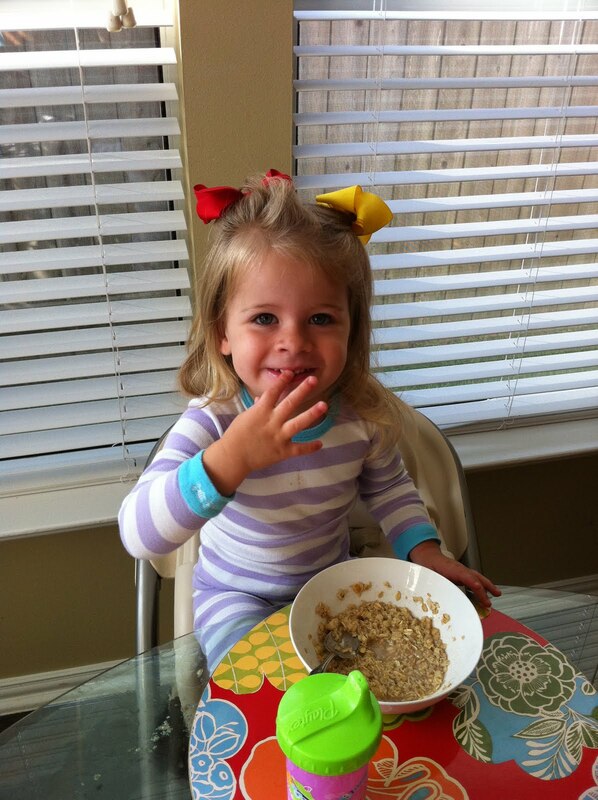 In true Jones family fashion, she has on Christmas pajamas. Her bed has some random stuff on it right now because I plan to have a quilt made out of her baby bedding. Knowing me, it probably won't happen any time soon. The box spring won't be delivered until tomorrow. 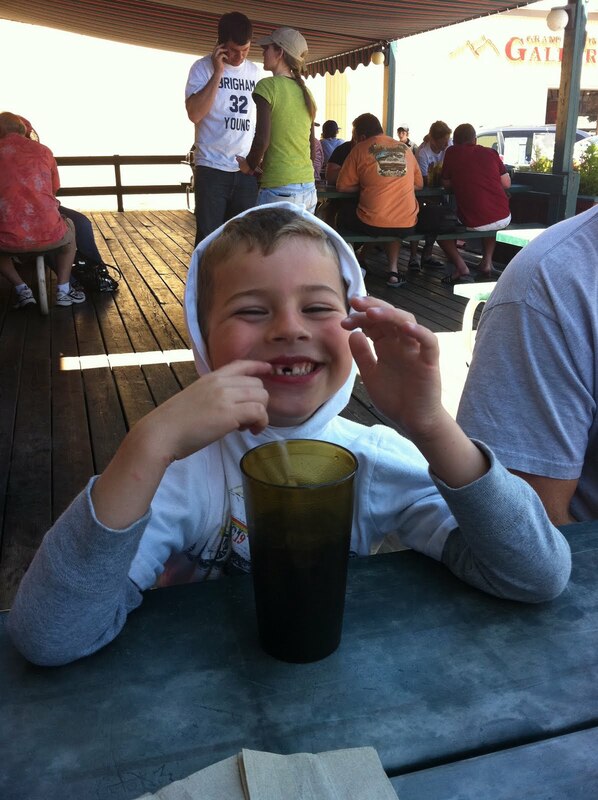 I was grateful that Jackson woke up excited about day two. He got to open a card from his old babysitter, Miss Sara. She is so sweet! I was much less frazzled during picture taking time and anticipating the camera issues. 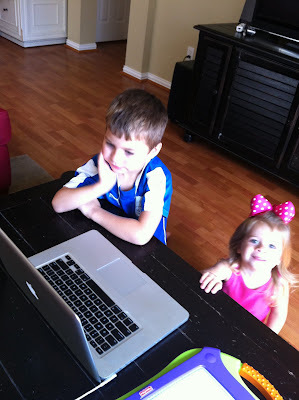 When I started this blog five and a half years ago, I could not imagine the day I would take Jackson to kindergarten. I can't believe we have come this far. Thanks for taking this journey with us. Okay, let's hear it. 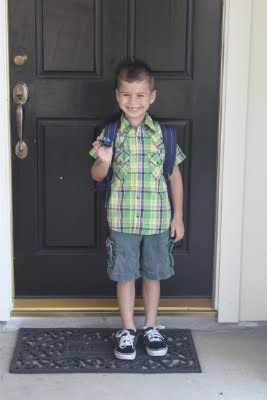 Mamas, teachers, and internet peeps, what is your advice for Curtis and me as we send our firstborn to elementary school? 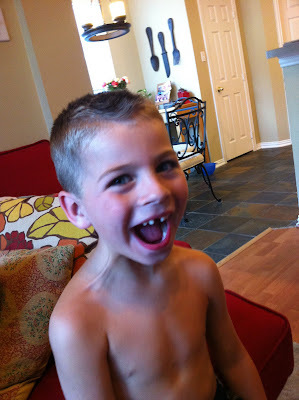 I took this picture today after Jackson's pre-meet-the-teacher hair cut. Last night I was fishing for compliments from my husband (don't hate, you do it too) and here's what I got: "Babe, your heart is enormous." We laughed really, really hard and then I waited for him to tell me my brain is equally enormous. I'm still waiting. Well guess what, Curtis Jones? I figured out how to import pictures from my iPhone to my computer. So clearly my brain IS enormous. Prepare yourself for some exciting pictures, people! Although if you follow me on Twitter (@AmandaMoJo) (MoJo is for Moore Jones) you have probably seen a lot of them. A few may have been on the blog before but I've slept since then. So just go ahead and cut your excitement in half. 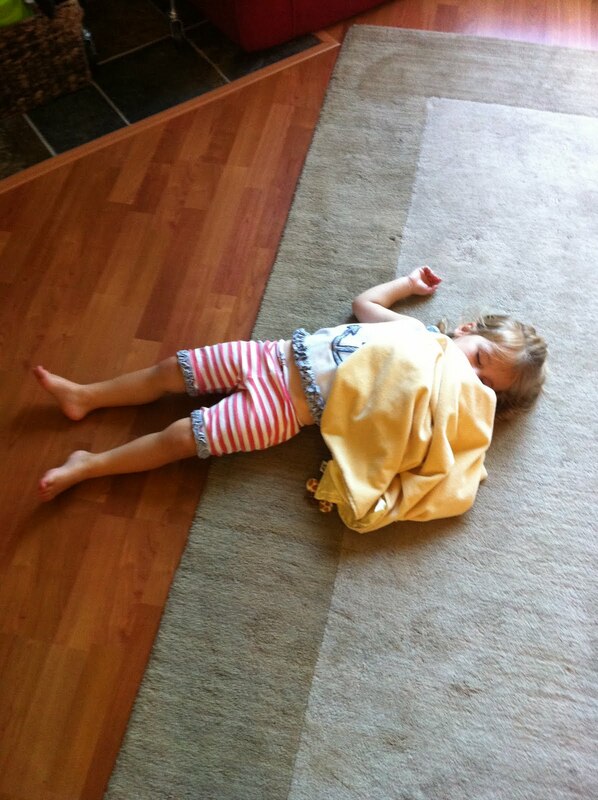 This is how I found Annabeth one day while she was watching Tangled for the 99th time. 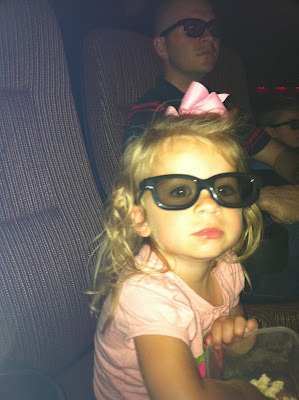 Here she is at her first movie - Cars 2 in 3D. She lasted about 30 minutes. This is when we took our living room back from the kids. The coffee table came downstairs, the toys went upstairs, and we bought a new chair from Marshall's that just happened to match the 3-year-old pillows we already had. Score! 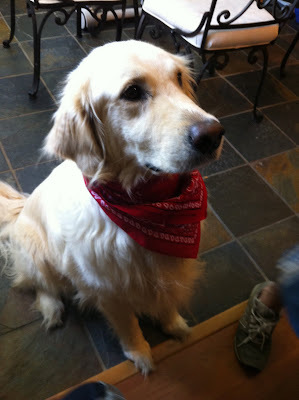 Here's Beckham J. on his 7th birthday. One day we had a Chickfila picnic in the front yard. 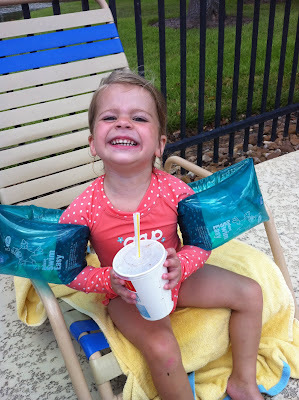 This must have been in June because mama doesn't like to go outside if water is not involved during July and August. 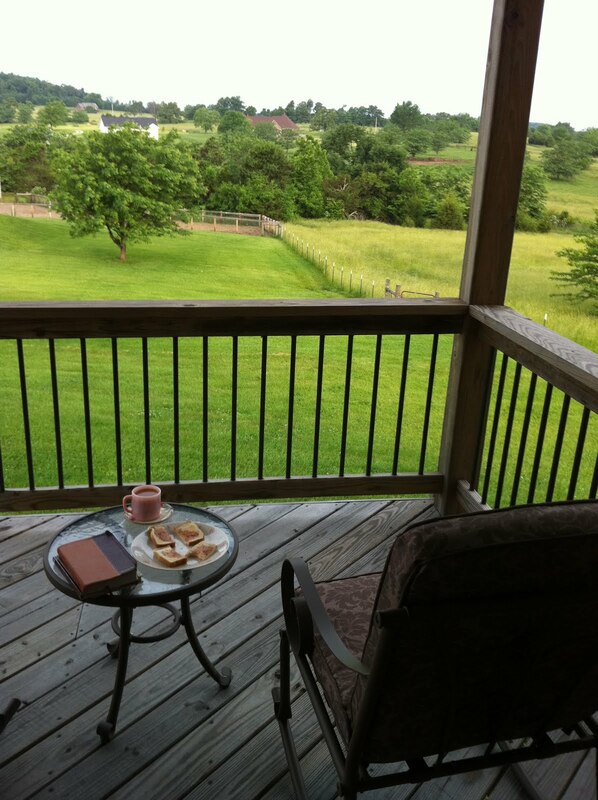 This is where I had my quiet time when we visited Curt's family in Missouri in May. 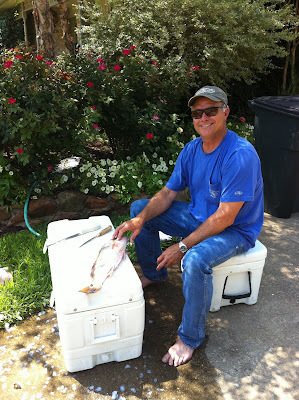 My handsome daddy cleaning fish on the driveway. This is how I picture my dad when I think of my childhood. 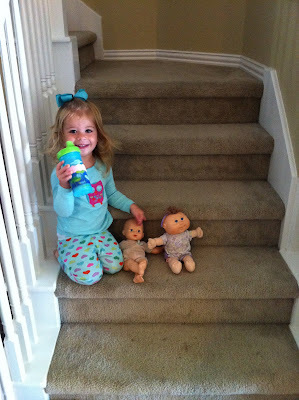 Annabeth putting her babies in time out. 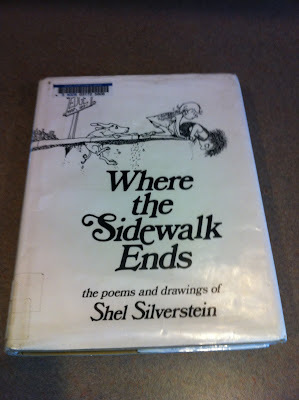 I checked this out at the library for Jackson early this summer and he loved it. One day I heard him mumbling and he told me he was making up a poem. He still talks about this book. 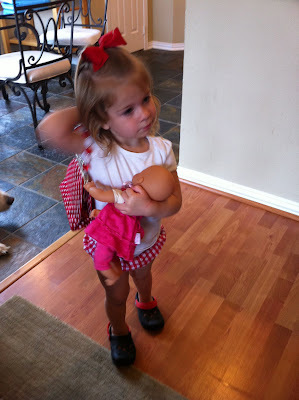 My sweet girl with her purse and her baby doll. Ready to run errands! 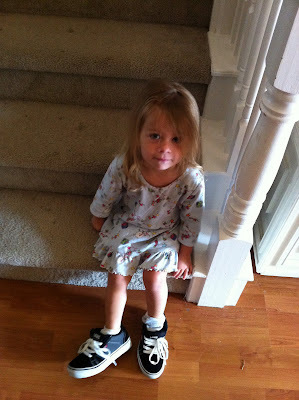 As in the picture above, she is wearing some of her brother's old shoes that she fished out of the bottom of his closet. 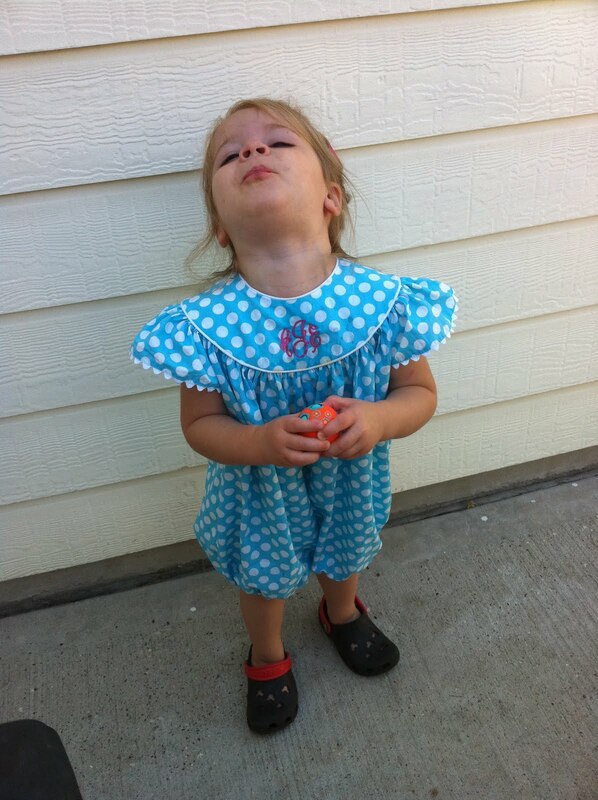 Not only are they hideous with her turquoise bubble, they're on the wrong feet. 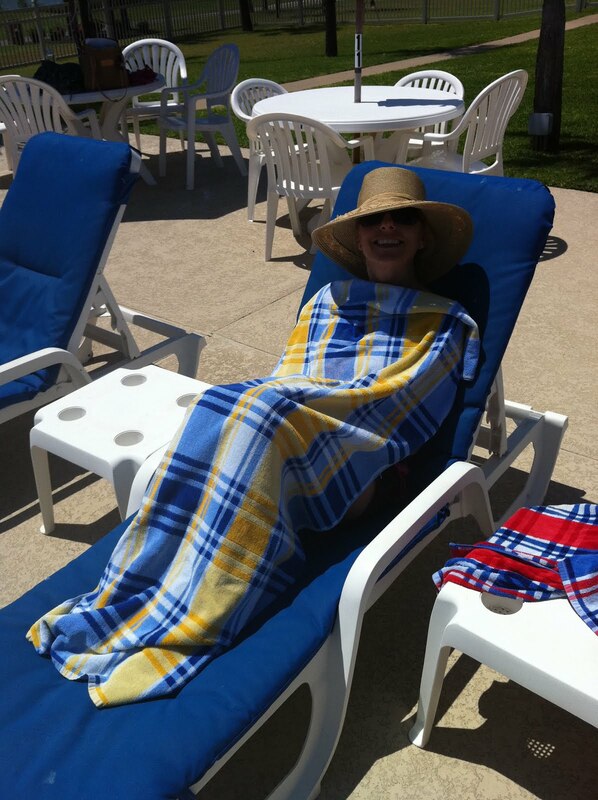 My mom avoiding the sun while we had a girls day at the pool. 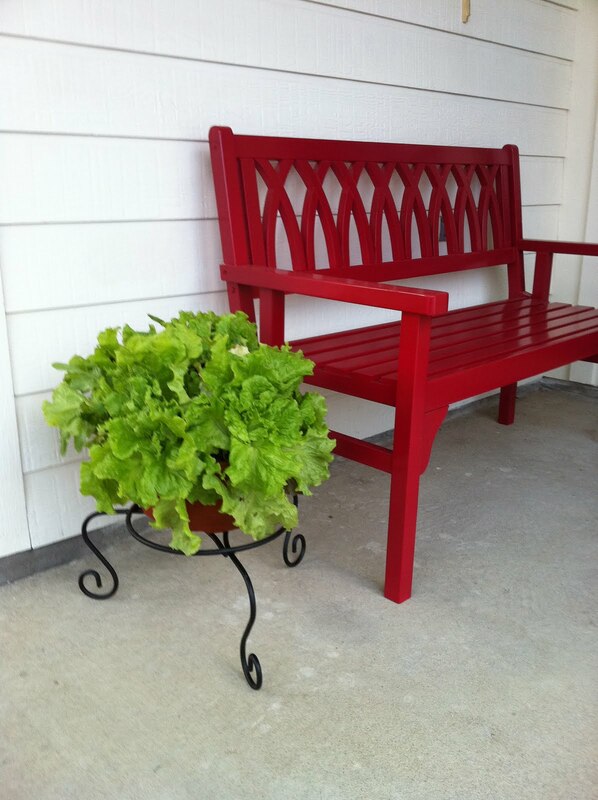 This is the beautiful leafy plant I bought for my front porch a few months ago. When I got it home I realized it was potted lettuce. It became known as Caesar. I enjoyed it's offerings on a couple of sandwiches before its untimely demise when we were in Florida. This was when Annabeth got a hold of my lipstick for the first time. 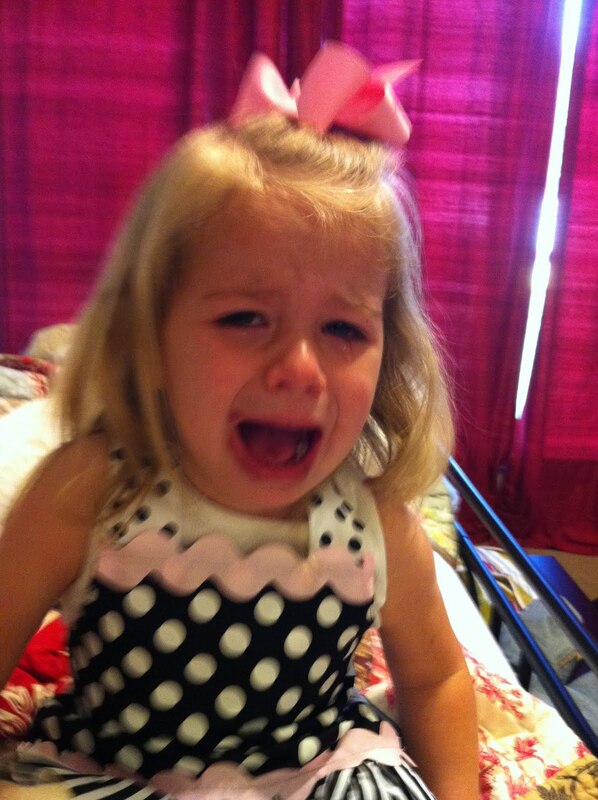 She's crying because I sort of overreacted when I found her. 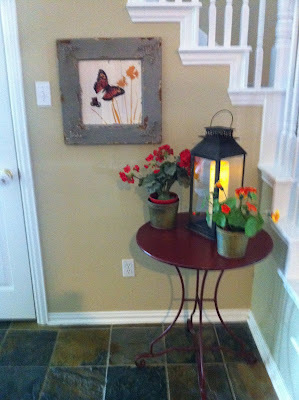 But she did a pretty decent job! This is how Jackson held his nose underwater in the beginning of the summer. 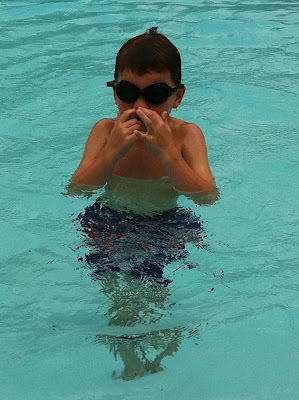 One finger in each nostril. My friend Corey at her adoption garage sale. She's sporting her grandmother's fabulous coat. On this day Annabeth earned a new nickname - Urchin. Again with Jackson's shoes. Annabeth and Angela on our church's first ministry day in Spring Branch. We were blessed by the man with the ice cream cart. 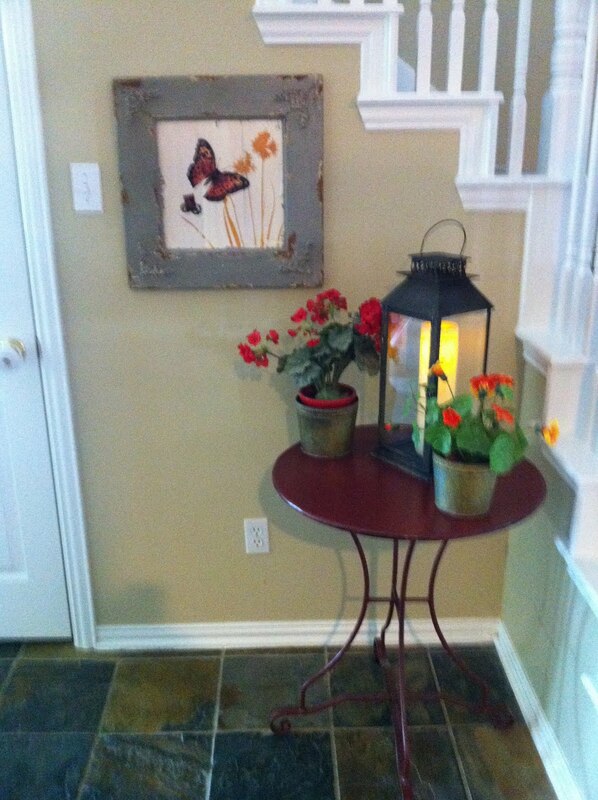 I took this after finally perfecting this little corner by the staircase. 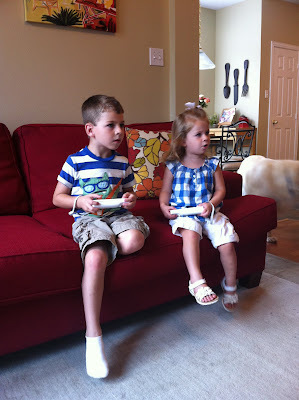 The kids playing Wii together. Annabeth didn't know she wasn't really playing. She asked for these two bows. 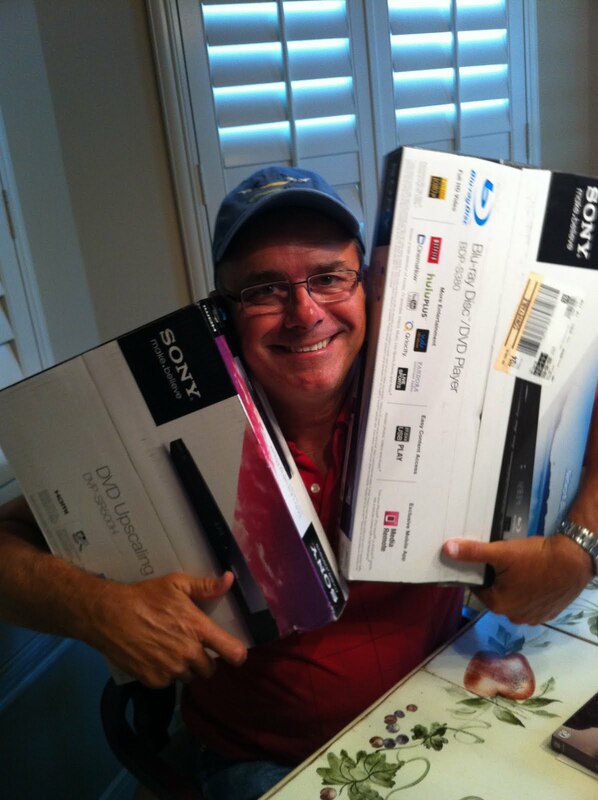 This is my daddy with the DVD players that my sister and I accidentally both got him for his birthday. Annabeth pushing Ellison in her baby brother's stroller. 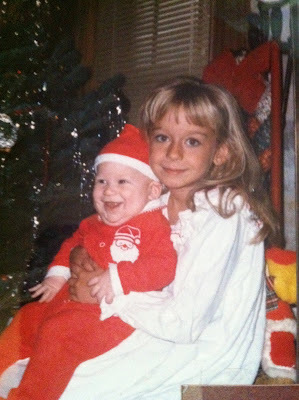 This is a picture of a picture of me holding my cousin Zach. We saw my friend Jenny and her boys at the pool a few weeks ago. I had to get a shot of our kids together. Jenny was my very first friend in kindergarten. This was Annabeth sleeping in a big bed for the very first time. We were in Wyoming and didn't have a pack-n-play like we thought we would. 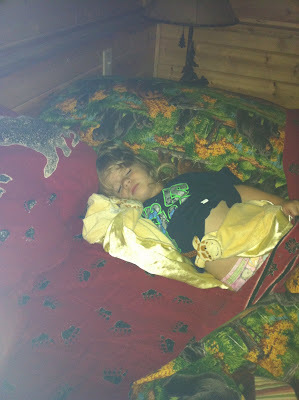 She was sleeping in Jackson's shirt because her bag was temporarily lost by the airline. I admit I nearly freaked at the thought of the bow collection it has taken me 2.5 years to collect being lost. 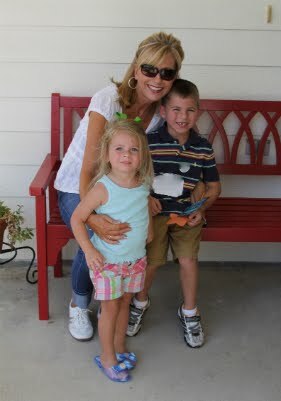 Jackson and I had a special date while Annabeth went to day camp. I took him to breakfast at McDonald's and then we went to Splashtown. So much fun. At the pool again, where we'll probably spend most of this week.